The aim of any company making protein-based therapeutics is to get to the clinic quickly with a product formulation that has the best chance of success. Any number of specific formulation development and manufacturing issues can keep such drugs from advancing expeditiously to the clinic. To be successful organizations must balance the strengths and weaknesses of each individual molecule against timelines, budgets, and priorities. Ultimately, it’s not just about deploying the best methodologies and processes, but of applying them appropriately and at the right time. This first of a three-part series describes a new contract research organization (CRO) business model that integrates functions in early clinical formulation development and manufacturing. An integrated contract development and manufacturing organization (CDMO) executes science, technology, and manufacturing compliance to address the typical issues that prevent protein products from moving swiftly from laboratory to clinic. Ultimately, this integrated approach helps ensure that clinical trials test the efficacy and safety of drugs rather than the limitations of their formulations. In some respects, protein formulation and manufacturing are quite well understood. Scientists have described many properties that must be balanced when developing large-molecule formulations. Regulatory mandates also dictate procedures and processes that must be followed to ensure product safety and quality. But the practice of protein formulation development and manufacturing is still considered very much an “art.” Most companies today rely primarily on the experience and intuition of individual scientists to develop formulations. Some have also let a combination of domain expertise and institutional mandates lock them into development platforms that bring advantages and disadvantages when it comes time to execute — such as going to market with only lyophilized or liquid formations. Finally, data generated during development and manufacturing too often fail to provide scientists with needed guidelines. There are many reasons for that. Such programs produce tremendous amounts of data, which can rapidly overwhelm an organization’s staff. Companies must also ensure that they are actually collecting and analyzing the right data to inform go–no-go decisions. Most important, any data collected will be useless if not made readily available to scientists, technicians, and managers as they make the decisions that drive product development. As product sponsors explore the potential of large molecules to provide therapeutic benefit in a range of key indications, protein formulation and manufacturing must transform from art to science — to become an information-driven process that focuses expertise and technology on formulation-relevant problems. Such a process cannot be built or maintained by a fragmented set of siloed, boutique services or cobbled-together “one-stop shops.” Instead, a new contract business model is needed. It needs to execute science while considering material, time, and cost constraints alongside the regulatory and compliance issues associated with developing and manufacturing early clinical supplies. The process must also take into account the appropriate use of high-productivity research tools and scientific informatics to tackle difficult formulation challenges that can be costly and time consuming to solve using traditional methods. Ultimately, the integrated process enables information-driven R&D by providing a wider, richer view of the formulation development “space” where scientists can discover new techniques or match formulation properties to specific applications while simultaneously reducing costs and conserving materials. Formulation development and manufacturing have traditionally been viewed as completely separate unit operations, mainly because each requires highly specialized knowledge. On one side are protein scientists and analytical chemists capable of elucidating protein function and formulation properties under a broad range of conditions. On the other side are manufacturing and quality control engineers who must implement and maintain methods and procedures for monitoring, validating, and verifying all equipment, procedures, methods, and materials to ensure that they comply with CGMP regulations and other pertinent regulatory mandates. Not surprisingly, a number of CROs have formed in the past decade to deliver boutique offerings targeting such areas as protein characterization, analytical methods development, and manufacturing of clinical supply. Generally, modern biotech product sponsors have embraced CRO involvement because it enables them to focus on critical core competencies while leaving noncore (but no less essential) functions to organizations with more capability and investment in those areas. Currently, the combined formulation development services and aseptic fill/finish market is estimated to be valued at US$250–500 million, with 50–65% of the work outsourced. Simultaneous with the trend toward outsourcing, large-molecule formulation has become a critical area of interest for life-science companies. 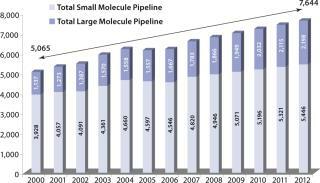 Large molecules comprise a third of the US pharmaceutical product pipeline and are entering it nearly two times faster than small-molecule candidates (Figure 1). Added interest in biologics has forced many companies to confront exceedingly complex formulation programs, such as attaining higher concentrations to enable subcutaneous injection of drugs, achieving stability at room temperature (or higher), or finding tolerable delivery routes for highly viscous formulations. These challenges require a new way of approaching formulation development: one that includes methods and techniques for screening different surfactants, tonicity modifiers, and other formulation components en masse to map the experimental space associated with each candidate compound. Such an approach can reveal breakthroughs or pinpoint gaps in thinking that can be easily obscured during one-at-time formulation efforts. Services offered piecemeal by disparate vendors make it harder to resolve the obstacles standing between potential large-molecule drugs and their potential patient populations. Sponsors rightly serve as the hub for all collected findings and subsequent decisions — but they may receive conflicting or insufficient advice on the course of action to pursue. A new contract business model would help such companies by integrating protein formulation and manufacturing functions into a single organization. A protein formulation CDMO would provide the experience and expertise to rapidly characterize candidate compounds, help sponsors identify likely formulation candidates, and select the most viable formulations for clinical trials. A CDMO puts the emphasis on managing data and laboratory workflows and connecting and streamlining functions to empower subject-matter experts. Within such an integrated framework, scientists, technicians, engineers, and business managers are armed with the data they need to make decisions, work effectively, and apply innovative methods that meet specific needs at the right time in an over-arching business process. faster cycle times for scientists sharing data across functions to inform decisions, build on each other’s work, and/or avoid repeating experiments. As Figure 2 notes, critical activities in formulation development and manufacturing are heavily weighted toward the early clinical phases. The first step in formulation development is characterization, in which physical properties and formulative behaviors (structure, stability) of a candidate molecule are assessed and analyzed. 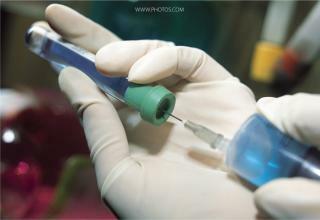 Assays and other methods of testing properties are also developed during this preformulation. All those activities inform the others, and a clear idea of molecule characteristics and formulative constraints can help companies more rapidly optimize their formulations and prevent manufacturing delays. Following preformulation, companies typically take several promising initial formulations into clinical testing. Usually, these formulations are used simply to determine a candidate molecule’s efficacy and safety, which makes storage and stability less critical to their initial formulations. But at this phase, speed is important because the results will dictate whether a product is worth continued support. Organizations therefore require smooth transfer of processes from development to manufacturing along with flexible yet rigorous manufacturing methods and documentation workflow to ensure that lots are released expeditiously to clinics. While candidate formulations identified during preformulation studies are tested for efficacy in phase 1, efforts begin to deliver optimized formulations that demonstrate stability and safety and conform to the specific delivery methods and storage routes required by a product’s indication. The optimized formulations require lengthy, real-time testing and even more rigorous process requirements, with the goal of meeting the requirements associated with NDA/BLA filings. rigorous, CGMP-validated quality assurance programs that not only quickly and consistently manufacture a specified substance, but that enable the release of stable, high-quality lots in days rather than months. An integrated CDMO introduces a process that leverages formulation development and manufacturing expertise to balance the needs of a molecule against the priorities, timelines, and budgets of its sponsor company. A CDMO also incorporates high-productivity research technology and methods to solve challenging formulation problems that strain the capabilities of traditional, manual methods. Most important, an integrated CDMO is well positioned to address and respond to issues that can impede formulation development and manufacturing. Parts 2 and 3 of this series will describe how an integrated approach to protein formulation development and manufacturing provides direction and informed oversight, which can help life science companies get to the clinic faster — with a better formulation — than ever before.